With 21 playgrounds that are unique in design and character, Central Park offers play options for children of all ages and interests. It’s easy to find a playground based on location or age (see a map here) — but are you looking for the perfect playground for your children’s personalities or passions? We have you covered. 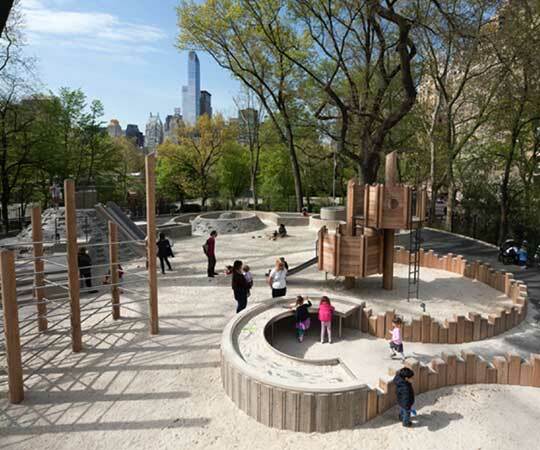 For adventurous types: Six of the Park’s playgrounds – Adventure Playground, East 72nd Street Playground, Heckscher Playground, Tarr Family Playground, Ancient Playground, and Billy Johnson Playground – are built in the adventure style. Adventure-style playgrounds were created in the 1960s and 1970s as an alternative to playgrounds with traditional equipment. They include interconnected play features that encourage exploration and imaginative play. The first adventure-style playground in the Park was Adventure Playground, opened in 1967; it includes maze-like features, a wood pyramid climber, and a conical climber with tunnels and a slide. For restless youngsters: Heckscher Playground is not only the oldest playground in the Park (created in 1927), but it’s also the largest at 1.8 acres – providing plenty of space for kids with lots of energy! This playground includes swings, slides, a maze-like climber, an extensive water feature, and other fun equipment with a stunning view of midtown Manhattan. Its primary entrance is the central breezeway of the newly restored Heckscher Building – which also contains restrooms, making it a convenient place for families to spend the day. For kids wanting to make a splash: Looking for a fun way to cool off in the summer months? You’re in luck! The water features inside Central Park’s playgrounds provide an easy and fun way to beat the heat. Water features are in every playground in the Park, except for the Pinetum Playground. Many of the playgrounds’ water features are interactive. 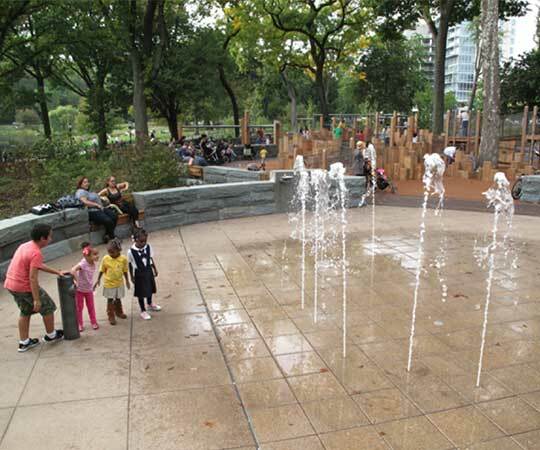 For example, you can control a dancing water display with the push of a button at the East 110th Street Playground — the water sprays differently each time. For children who love sculptures: Safari Playground contains beloved hippopotamus sculptures that are a huge hit with kids. The hippos are set in a “river” of blue safety surfacing, and vary in size and height — perfect for climbing over and underneath. The “Group of Bears” sculpture (often called “Three Bears”) is another popular statue by Paul Manship at the Ruth and Arthur Smadbeck-Heckscher East Playground. It’s great for a photo-op or climbing adventure. For art enthusiasts: Inspired by the Metropolitan Museum’s collection of Egyptian Art, Ancient Playground features climbing pyramids, a small obelisk, and sundial. Ancient Playground’s entrance also features the Osborn Gates, which contain fanciful depictions of five vignettes from Aesop's Fables. These stunning cast-bronze gates were created by renowned sculptor Paul Manship, the same artist who created the Prometheus sculpture at the Rockefeller Center Skating Rink. For slide aficionados: Billy Johnson Playground’s most popular feature is its granite slide, which is set in a rocky hill that fits in well with nearby rock outcroppings. The curved 45-foot slide is easily the focus of most playground activity — with lines of children waiting to ride it, and caregivers and other children watching from below. Visit soon! This playground will be closed for renovations later this summer. For kids at heart: Want to join in on the fun with your little ones? The Pinetum Playground is located within the Arthur Ross Pinetum, a small arboretum that is home to the largest collection of pine trees in Central Park. With its open setting (there is no fence), the playground is often enjoyed by adults as well as children. Along with swings and chin-up bars, the area includes picnic tables and open lawns, making it a great spot for picnicking. No matter your children’s interests, they’ll never get bored exploring Central Park’s entertaining playgrounds! These spaces not only provide fun play areas for kids, but they’re critical to the health and development of the more than 3 million children who visit them each year. As part of the Forever Green campaign, the Central Park Conservancy is restoring all of the Park’s playgrounds, ensuring that children of all ages and abilities will have access to optimal play spaces. Visit our playgrounds page for more information on how to support these projects, or join our Playground Partners to help us maintain these unique spaces. Playgrounds are open from 8:00 am until dusk, weather permitting. To check if any playgrounds are receiving scheduled maintenance, visit our alerts and closures page.